Our aim is to preserve and share the history of Nillumbik. We have a large archive of photographs, artifacts and historical documents relating to people who have lived in the area and places in the district they lived farmed and mined, with a particular focus on the wider area around Diamond Creek. The Society has had a busy year and achieved a great deal, our volunteers have put in uncounted hours to make sure our projects have been successful. We have supported and been supported by the community in a number of ways and would like to thank everyone involved with the Society and who have supported our projects throughout the year. In late 2017 we had the official opening of our Lone Pine Memorial Garden which commemorates the Battle of Lone Pine in 1915. 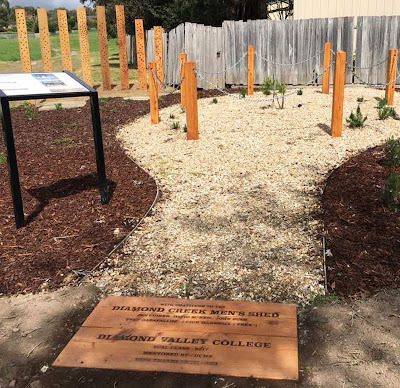 The garden was designed and built by the 2017 VCAL class from Diamond Valley College. During the six months it took for the garden to be completed we learnt a lot about how much inter-generational projects can give to all who are involved. Young and old also found that age doesn’t really matter because everyone has something to give and, we all learnt about respect, co-operation and sharing knowledge and skills. That first stage of the project was successful because of the dedicated, and ongoing involvement of local community groups - Montmorency-Eltham RSL, Diamond Creek Men’s Shed, Diamond Valley College, Banyule Nillumbik Local Learning and Employment Network and the Nillumbik Historical Society. The memorial garden has a plaque that has the story of the Battle of Lone Pine. 2018 saw the start of a new stage of the project to complete the area around the garden and make the area next to our barn a place where people can sit and contemplate, learn about how WW1 affected the local area and those who served and those who did not come home. We now have three flagpoles for use on ANZAC Day, Remembrance Day and other days according to the RSL calendar. A second plaque will be installed that has the names of all 29 men who served in WW1 and who died during the conflict. The third stage of the project will kick off next year with a planned plaque on the wall of the barn with the names of the 110 men from Diamond Creek who served during WW1. The students with the support of their teachers also laid a new concrete path between the barn and Ellis Cottage. Over a few weeks, they organised themselves to allocate work and skills and under instruction laid out the mesh, put in spacers and when the concrete truck arrived had a lot of fun spreading, and smoothing it. The path which now has all of the students names etched into the cement is a welcome addition to the cottage precinct. Its full worth was felt in winter when for once there was no mud tracked into the cottage or barn! So much of the work, much of it pick and shovel, is done by the students. We are so appreciative of their good humour, willingness to get stuck in and to try anything new. We couldn’t be happier with all of them and we look forward to a new group of VCAL students, and some we already know who will return for their final six months of school in 2019. The Society would like to thank Diamond Valley College who have supported us for more than two years, allowing their VCAL students time each week to come to Ellis Cottage and help us with whatever work needs to be done. It has had an incredibly positive affect on all and even though we are working there is always fun, jokes and a relaxed atmosphere. We are proud to be supporting them and to have had some input into their work placements and experience. Another work placement we have supported during 2018 is a VCAL student from St Helena College with an interest in history. They have helped us for one day a week since April, photographing our artefacts, scanning old documents and updating our database and will return to continue their placement in 2019 for the final six months of school. 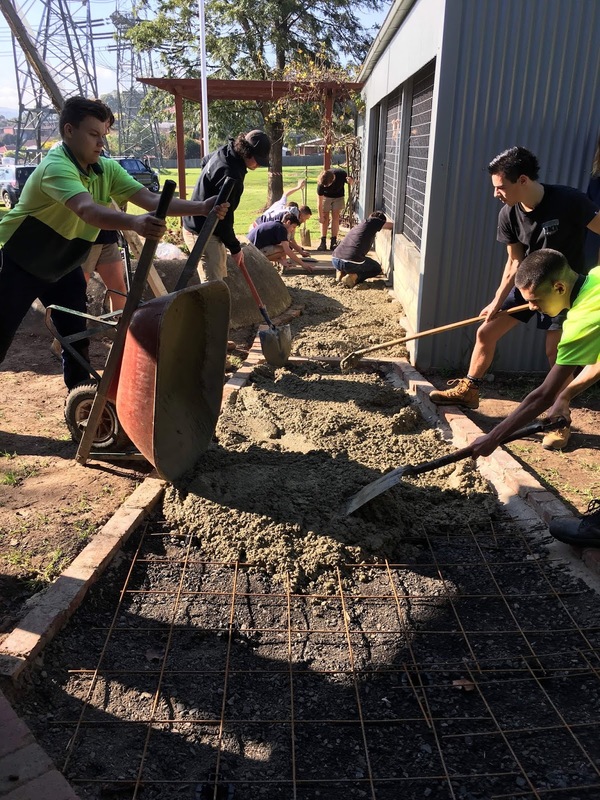 After the VCAL students finished up in late October, Year 9 students came along for a few days during November to help out with landscaping the Lone Pine garden area, and digging a trench. Some of them plan to go on to VCAL so it was lovely to meet them early on and get to know them a little. In March we published five local history books covering many aspects of the history of Diamond Creek and the surrounding area. 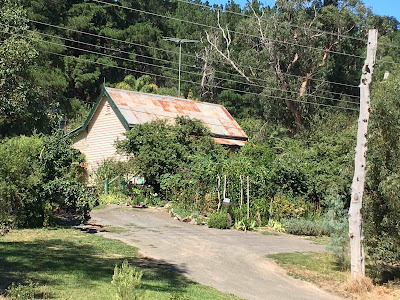 Uncle and nephew William and Nathaniel Ellis developed and worked the farm to the north east of Diamond Creek from the 1850's where Ellis Cottage now stands on the reserve along Main Hurstbridge Road. When Did it Happen in Diamond Creek? 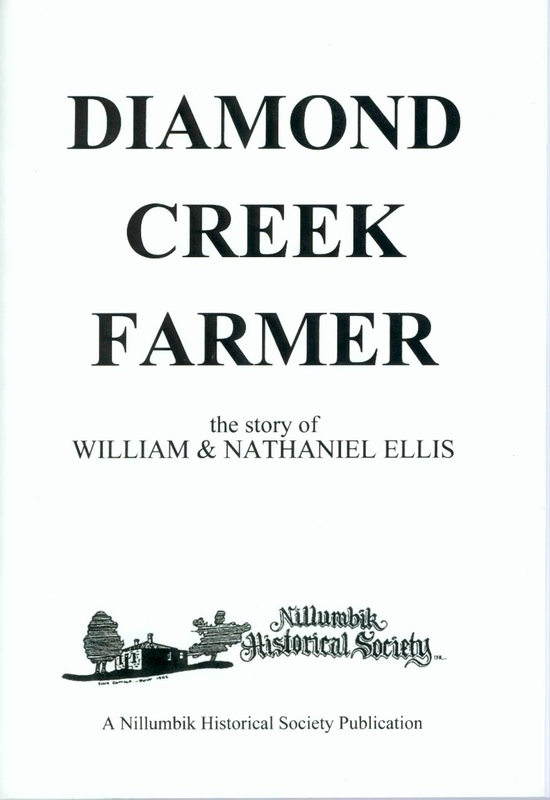 This book is a chronology of the place originally called Nillumbik or Nillumbik on the Diamond Creek and now Diamond Creek. It starts from the 1830's and runs through most years to the 1920's. 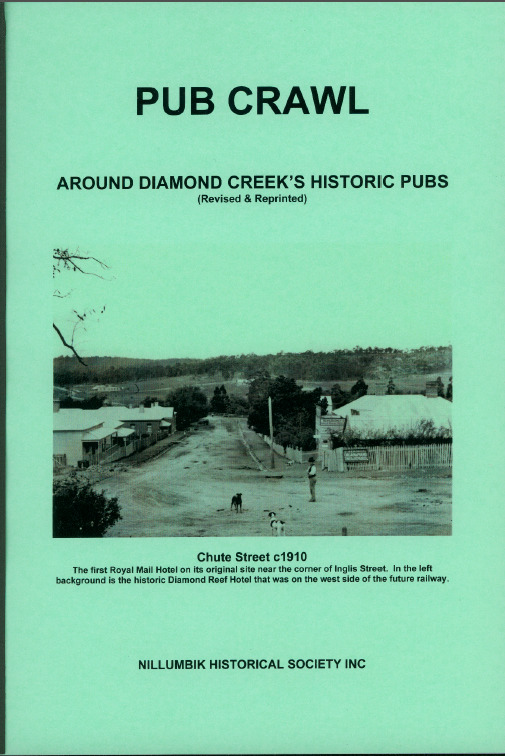 Diamond Creek had five pubs in the mid 1800's, most were built or were started to house, feed and water the miners who flocked to the area from the early 1860's when gold was discovered. 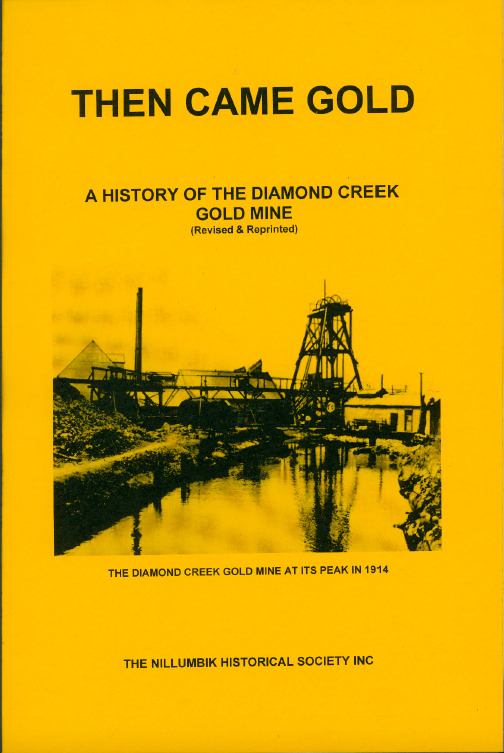 A history of gold mining in Diamond Creek from the early 1860's to the 1950's. 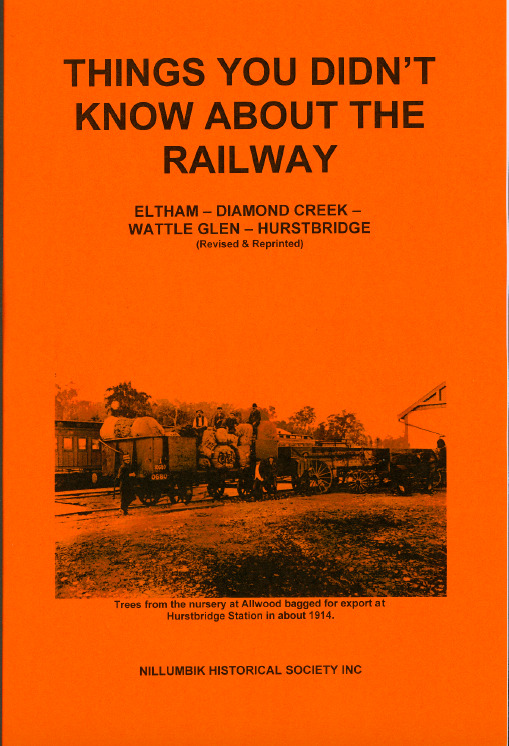 The story of the need for and the extension of the railway line from Eltham to Hurstbridge and the fruit growers and other residents who needed it. Copies of all five books were donated to each primary and secondary school in the Shire of Nillumbik. We are proud to offer these for sale at $10 each. With the help of some enthusiastic volunteers we have started a Transcription project. Our aim is to eventually have digitised and transcribed copies of all of our important documents and letters available to the public. It is the beginning of what will be a long project, so we are starting small to make sure we have the most efficient process possible. The first ‘mini’ project is scanning and transcribing letters written home from France during WW1 and our hope is that this will be a standalone collection that will be of value to family and local historians. However, it is early days and we have a lot to do. 18th March Harvest Festival Celebration and Blessing the Plough service with members of local churches. 10th April We took delivery of a 100 year old Harmonium organ donated by the Graham family of Kangaroo Ground. It is now the centrepiece in the front room of Ellis Cottage. 25th April The Society attended and laid a wreath at the Diamond Creek ANZAC Day service. 27th May We spent a lovely Sunday afternoon at Ellis Cottage with about 30 people listening to Irene Hayes play the Harmonium donated by her family. 25th August Sausage Sizzle at Diamond Valley Mitre 10 manned by our wonderful volunteers. A successful day of selling sausages, books and chatting about local history. 26th August Stall at the Hurstbridge Wattle Festival where we had great weather, large crowds and a fun day talking to visitors about the history of the Eltham to Hurstbridge railway extension, the history of Wattle Day and local history in general. October We put in a Butter Making display at Diamond Valley Library for the full month which had many of our artefacts that were used for butter making and the story of what they are and how they were used. 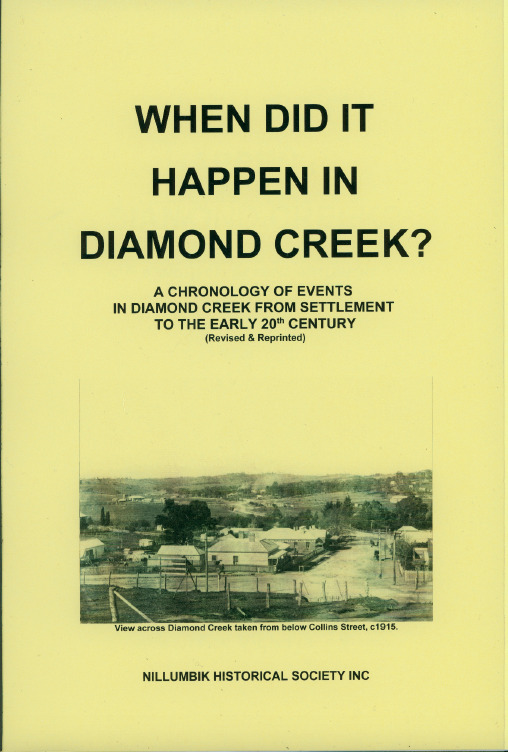 2nd October We gave a talk about the History of Diamond Creek at Diamond Valley Library to a good audience in support of History Week. 2nd December Our annual Christmas get-together and Christmas hamper raffle. We are looking forward to another full and enriching year in 2019 but will now take a breather for a few weeks to enjoy the festive season with our families. In the 1870's there were farms and settled land along the creek flats, hills and gullies to the north of the township that is now Diamond Creek. As population increased in areas north to Allwood and beyond, the need for a school for the local children became apparent. 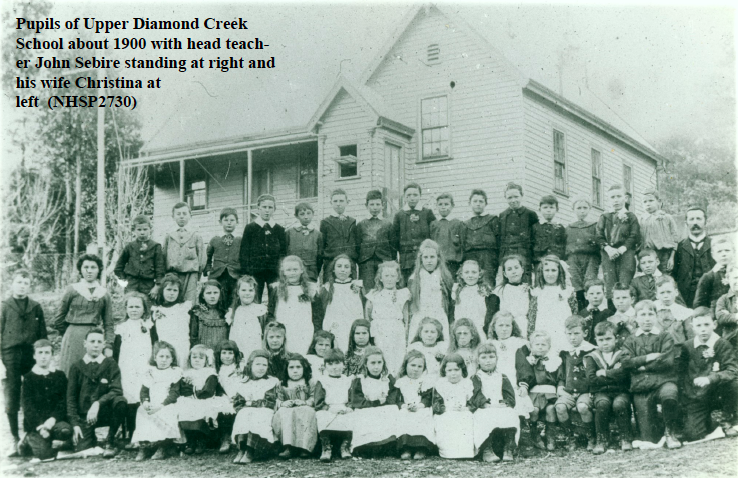 With the state school at Diamond Creek already established and with an extension planned, a school with an attached residence for a head teacher and his family was also built in 1876 at Upper Diamond Creek. The schoolhouse and residence at Upper Diamond Creek and the extension to the Diamond Creek State School were built by Charles Verso who in later years married a local girl, Annie Herbert. In later years they settled on a property north of the township of Hurstbridge. Mr Sebire and his wife Christina were active in and supportive of the community during the years they lived at Upper Diamond Creek and two of their children attended the school. When John Sebire and his family left the district in August 1907 to take up a new appointment the local community held a social evening and presentation in appreciation of their service to the community. An article in the Evelyn Observer and Bourke East Record of Friday 30th August, 1907 gives us some wonderful detail of the proceedings and includes some familiar family names from the local area. The residents of Upper Diamond Creek on Thursday evening, 22nd inst., invited Mr. and Mrs. Sebire and family to a social evening prior to their departure from the district. The Mechanics' Institute, which had been most tastefully decorated by the ladies of the district, was crowded and for several hours time passed very pleasantly and merrily. Mr. Curtis presided over the function, and Misses Lily Burston, E. Yates, Woodward, and Alice Woodward, and Messrs. C. and N. Woodward, Boucher, and several others contributed, songs and recitations. During the course of the evening's festivities, Mr. Woodward, on behalf of the parents and residents generally, presented to Mr. Sebire a very valuable case of cutlery and to Mrs. Sebire a most beautiful afternoon, tea set. In doing so, Mr. Woodward stated that he desired, to testify to the great esteem in which the recipients were held by the residents, of their appreciation of Mr. Sebire's untiring and successful efforts as their school teacher, and of the great loss that the district would suffer by their departure. He assured them that they carried away with them the universal goodwill of the people of the district and wished them godspeed in their new sphere of life. Mr. Peers then, on behalf of the Diamond Creek Rifle Club, presented Mr. Sebire with a pair of valuable field glasses. Mr. Peers, who has been the Captain of the Club since its inception, spoke enthusiastically of Mr. Sebire's services as Secretary and Treasurer of the Club, and gave unstinted praise to him not only as a rifleman but as a teacher and a neighbour. Mr. Sebire, who received a most hearty reception, cordially thanked the residents for the many manifestations of their good will. He expressed the delight and the great gratitude that Mrs. Sebire and he felt at the hon-or which they were receiving at their hands that evening. He assured them that he felt completely overwhelmed at receiving such splendid gifts and that the recollection of their goodness would only end with his life. Not only had they entertained them in a royal manner that evening and bestowed upon them these costly presents, but he acknowledged with the truest gratitude that the people for 9 years had made them feel they were among true and warmhearted friends. He sincerely hoped that in the future they would see a great deal of each other, and extended a hearty invitation to each to visit Mrs. Sebire and himself in their new home. Three ringing cheers, with musical honors, were then given for Mr. Sebire and these were repeated for Mrs. Sebire. Ample refreshments were served, and several dances were enjoyed by the younger part of the company before this enjoyable social festival was brought to a close. The school children determined, however, that they should have a demonstration on their own account, and, during the afternoon, Misses Myrtle Durham and Linda Larson, on behalf of their schoolmates, presented Mrs. Sebire with a very elegant pair of silver salt cellars and spoons and Mr. Sebire with a very fine lamp. The girls each made a very neat and creditable little speech, to which Mr. Sebire responded, assuring them that he was especially pleased to receive a gift from the scholars, as it proved that in spite of the high pressure under which they had been worked for some considerable time he still retained their affection and good will. Mr. Sebire, who is departing for St. Kilda, is to be succeeded by Mr. Lyttle, of Rockbank. The school served the community well until a new school was built and opened in Anzac Avenue, Hurstbridge in 1916. The schoolhouse was moved from Upper Diamond Creek to the site of Wattle Glen Primary School, however, it burned down in about 1925. We are fortunate to have the part of the building that was the residence standing today in its original position on Main Hurstbridge Road. It is located just north of Yates Road and is one of a number of early buildings still standing in the area. Nillumbik Historical Society’s aim is to preserve and share the history of Nillumbik. We have a large archive of photographs, artefacts and historical documents relating to people who have lived in the area and places in the district where they lived, farmed and mined, with particular focus on the wider area around Diamond Creek. The Society was formed in 1973 with the inaugural meeting held at Lovitt Cottage, now known as Ellis Cottage. William Ellis migrated to Melbourne from Devon in the mid 1840’s and was an early settler in the district, initially working on a farm in Kangaroo Ground, until he took up land along the Diamond Creek in 1850. He added to his land holding in 1861 with the purchase of a neighbouring property. William lived on and worked the land living in a hut near the creek, and once established built today’s cottage using local stone completing it around 1865. The farm stretched from today's Reynolds Road across the creek flats and hills towards Wattle Glen. In 1870, William’s nephew Nathaniel also migrated from Devon. As William and his wife had no children and needed help, he came to support them on the farm. William and Nathaniel prospered during their time on the farm, giving back to the community and supporting development of the area. The farm stayed in the Ellis family until after William's death in 1896 when part of the farm was sold off according to conditions in his will. William also left a bequest of £100 to build the gateway at Nillumbik Cemetery, Diamond Creek. The gateway stands proud above the Sawpit Gully roundabout and is inscribed with the Latin words ‘Janva Vitae’ meaning Gate of Life. In the following years, the property was lived in by various families until the Lovitt family purchased the remaining land, including the cottage, in the 1960’s. Phillip Lovitt and Peter Marriage rebuilt the cottage during the summer of 1972-73, as by then it was in an advanced state of disrepair; it had been used for some time to store hay. The cottage stayed in the care of the Lovitt family until the surrounding land was sold, subdivided and developed in the early 1980's. As part of the subdivision, the cottage and seven acres surrounding it was passed to the Shire of Diamond Valley who repaired and rebuilt the cottage handing it to the Nillumbik Historical Society for safe keeping on behalf of the community in 1989. The reserve is still a public open place and is kept well maintained by the Shire of Nillumbik. Since the site was handed to the Society a number of additions have been made. The lock-up from the site of the Collins Street Police Station was donated and moved to the cottage precinct and is a good example of its type. We use it as a standalone display. The Nillumbik Historical Society has added a barn to the precinct to house our archives and display photographs and artefacts from our local history. We also use it for meetings and other gatherings. It was made possible by a great deal of fund raising work over 15 years so the barn could be built and fitted out. The barn also houses an archival facility which allows the Society to efficiently meet a growing community demand for information about the local area. The barn and archives area, along with the cottage, hold many of our historical documents, photographs and artefacts. 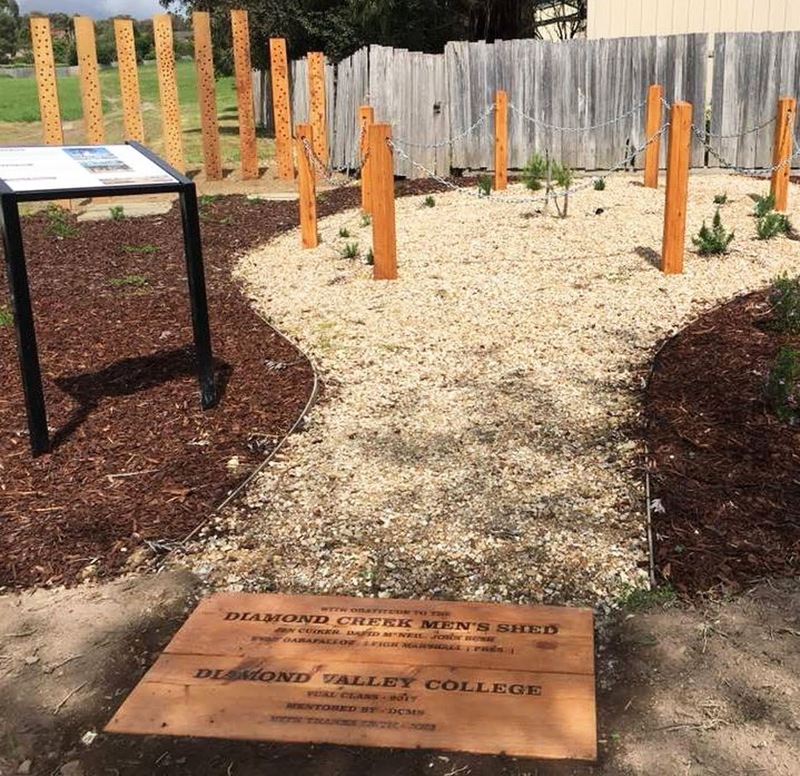 Our latest addition is the Lone Pine Memorial, completed in October 2017 after six months of dedicated work by VCAL students from Diamond Valley College, Diamond Creek Men’s Shed and with the support of the Montmorency-Eltham RSL and Banyule Nillumbik Local Learning and Employment Network. We take every opportunity to share information, photographs and objects we have gathered and received as donations over more than 40 years with the community. Our latest projects include storing images of our artefacts so we can put them online for a much wider community to view and beginning transcription of many of the letters we have, especially from local families during WW1. We are open to the public on the first Sunday of each month or by appointment, so please don’t hesitate to contact us if you are looking for information.